After a quiet period there's been quite a bit of singing lately as the birds who nest again started getting ready. So I was determined to get out for a bit of birdwatching. I did, and saw lots, but everyone looked so big! A common yellowthroat, really? It looks the size of a finch. And gradually I realized that it's the spider eyes. I am learning to pick out spider types by GISS, pulling me into tiny world. In the far field I saw these three. Two on milkweed, one on brown-eyed susan. One was Misumena vatia (Goldenrod Crab Spider), but the other two? One was clearly something quite different, the other just a little different. I did some research, in part by checking out Bev's (Burning Silo) Crab Spider Gallery, but couldn't find a match I had any confidence in. Looking at a recent post of Bev's, possibly the last one is Misumenops asperatus. Lovely spiders whoever they are. Thanks, Bev. These spiders are so often willing subjects. I've submitted that second spider to BugGuide--so we'll see if anyone comes up with the species. They are great photos, but I was wondering if they are poisonous? Because I was bitten by enoplognatha ovata/candy-stripe spider if you would let me know plz that would be grate. 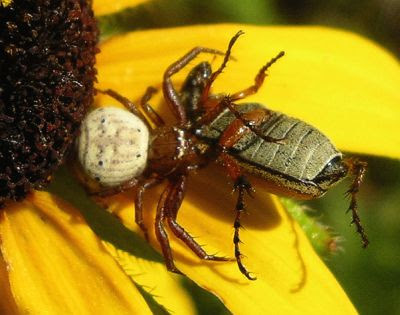 Most spiders live by their venom--designed for prey much, much smaller than us, so most (as in almost all) spiders can't hurt us, or can't hurt us much--a little swelling at the site of the bite maybe. 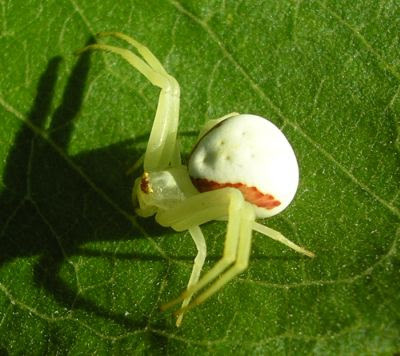 I wouldn't worry about Enoplognatha ovata. Ive seen these spiders in my yard (in New Hampshire) a lot this summer!! They're always all over my wild clematis and roses!! Any ideas what species they are? ?